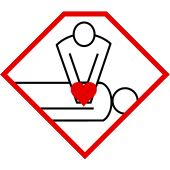 As of January 1st, 2019, CPR/AED HCP will now be referred to as Basic Life Support (BLS). If you are looking for an HCP course, please register for BLS instead. KMW Outreach Inc. is a community based company in partnership with Canadian Red Cross First Aid Services. Its goal is to provide quality First Aid training to communities in Ontario, giving them the skills to self-assist their members during times of need until more advanced medical support arrives. KMW Outreach Inc. also provides essential First Aid and safety products including various types of First Aid kits, Automated External Defibrillators (AEDs), as well as the resqme® tool. We have knowledge and expertise of First Aid requirements that community individuals face and will work with you to ensure you get the training and services you need. Our broad range of products and training services are certain to satisfy a variety of needs for individuals, communities, and corporations. Blended learning combines on-line and face to face instructions to achieve a Standard First Aid & Level C CPR Certification. KMW Outreach Inc is teaming up with Open Minds Mental Health to provide basic Mental Health First Aid training. KMW Outreach instructors are “everyday” people, trained by the Canadian Red Cross to deliver quality First Aid training. At KMW Outreach, we have made it our mission to provide community members with the skills necessary to help friends and loved ones in the event of a medical emergency while awaiting advanced medical support. Motorists can never be too prepared for an unexpected accident and the risk of being trapped in a vehicle. 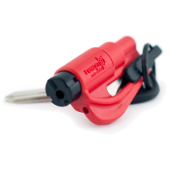 Our worldwide acclaimed safety solution, resqme is a keychain rescue tool that has already helped to save many lives. 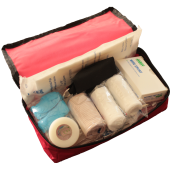 A variety of compact and cost effective First Aid Kits are available catering to a broad range of people and situations. The contents of each First Aid Kit can also be customized to suit your individual needs. Sudden Cardiac Arrest (SCA) is a leading cause of death globally. 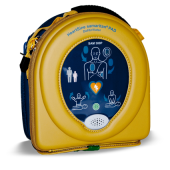 Response time is critical for survival and having access to an Automated External Defibrillator could mean the difference between life and death. We offer a variety of courses from the Canadian Red Cross including Standard and Emergency First Aid and CPR, the CPR/AED course, as well as the Canadian Red Cross Babysitting Course.